The world’s first 3D interactive art and dining experience, Ing3dients at the Ubiquitous Chip has been named the best experiential event in Scotland over the past year. 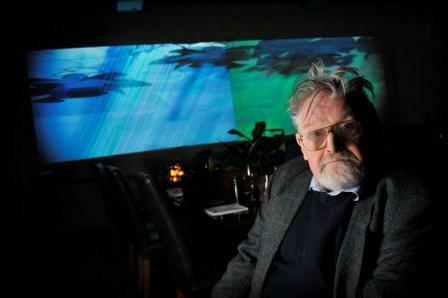 Combining the talents of Scottish artist, and long time friend of the Chip, Alasdair Gray and digital artist, Debs Norton, Ingr3dients saw diners interact with a host of art installations and witness the unveiling of Alasdair Gray’s first digital mural. Organisers, the Ubiquitous Chip and UZ events, were at the Scottish Event Awards last Thursday to receive the accolade for best experiential event. Ing3dients was also commended by judges in the best cultural event category. Ingr3dients was part of the restaurant’s 40th celebrations and was a joint project between the Ubiquitous Chip and UZ Events, with support from Black Bottle whisky. Guests enjoyed stepping on an interactive digital pool of fish and art installations including a 3D highland cow and leaping salmon which related to each course of the meal. The whole experience was accompanied by an audioscape, bringing together touch, sound, sight smell and taste over an entire meal. Featured image copyright of Maverick Photo Agency. For other images please contact Real PR.